Opie is at the Rainbow Bridge. We are so very sad. This tears out our hearts. We are a rescue after all. This is not the outcome that we wanted. 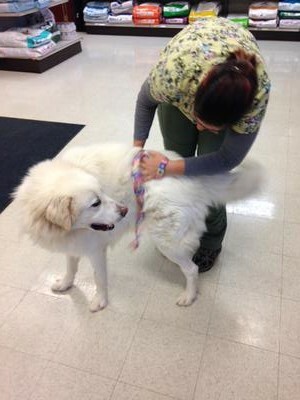 Opie came to us with an ear infection at 1.5 years old last November (2014). We had to sedate him to be able to get near his ears. They were treated ad did clear up. 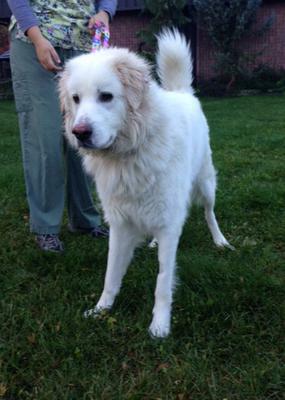 We could only guess as to Opi's background when he came in but we knew he was a mix of another big white or maybe even two, perhaps not even Pyr. It appears he hadn't been worked with much as far as touching him goes but he was sweet. He was then adopted out to a wonderful family last November who worked hard with him. Sadly, as Opie matured and bonded with his owner over the last nine months, he became extremely possessive of his owner and any place or thing he deemed his. 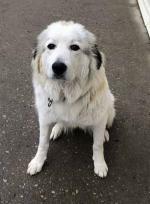 This characteristic is not something that can be redeemed and is not characteristic of a well-bred Pyr who has been properly trained and socialized. Dear sweet Opie, for his safety and that of his family, had to be euthanized. 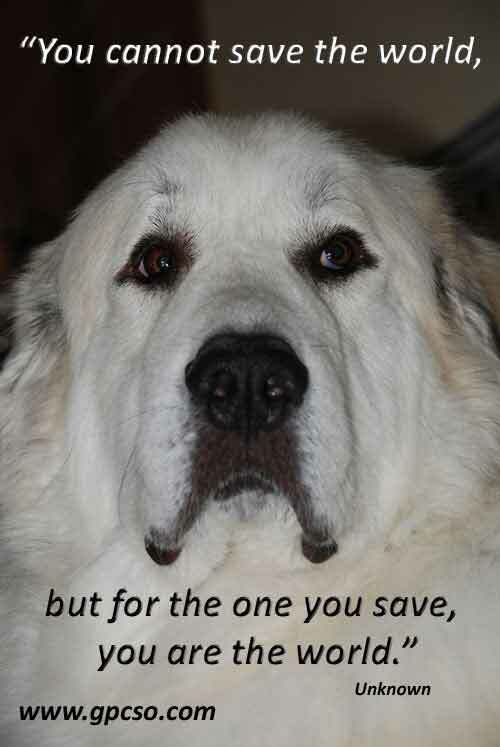 Please, if you want to bring a Pyr into your home, make sure you do your research. Avoid pups from farmers and backyard breeders. 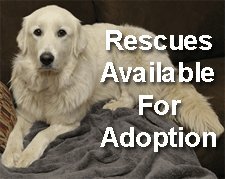 Talk to a reputable breeder about the temperaments and health of their Pyrs. Be aware that you must be committed to socialize and train your pup right from day one through its lifetime. Opie has found his forever home. 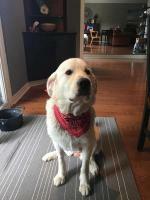 Opie was with a foster-to-adopt family and happily they have decided he is a good match. They have taken time and patience in allowing him to adjust in his new home. That includes Eric not brushing his hair because he wanted to make sure Opie was okay with him and unknown movements might have stressed him. It's paid off because Opie has now become a very loving boy, and he hangs out with Eric in the workshop. He isn't good around children but they have their plan in place to ensure they don't interact. OPie will have a job come spring,though. He will be guarding the chickens from the racoons. 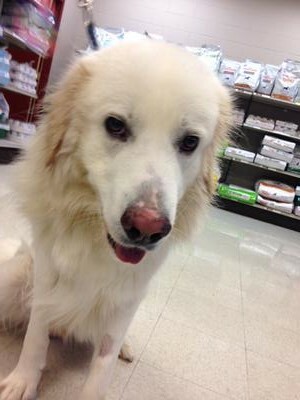 Opie is a 1.5 year old male Pyr-mix. 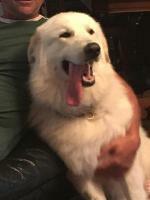 He was 'purchased' as a full-Pyr but he has Maremma or Akbash in him. He was surrendered as there was concern for his well-being since he was in someone else' care during his guardian's absence. His ears were badly infected on arrival and they are being treated. 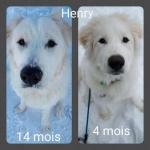 He is neutered, up-to-date on shots and microchipped. He is a very sweet boy who needs a stable and loving home. 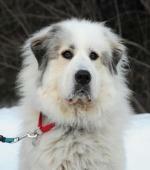 As a Pyr mix, he does bark, dig holes in your garden, and shed (all of this can be managed). He will wander if not contained so he will need a home with a minimum 5-foot fence within which he can play and watch his territory. 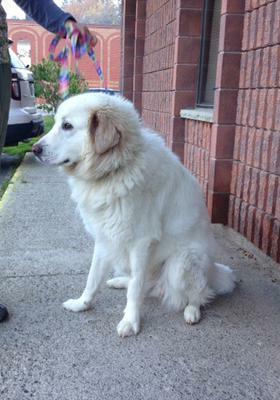 Pyrs needs patience and consistency in their training and someone who will work with their instincts. They are independent thinkers and, therefore, only listen if it's worth their while. Please do your research on this breed to ensure this is the dog for you. We have very good information on our website. 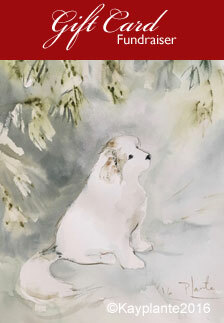 Please take some time to read about the Pyrenean Mountain Dog.